This entry was posted in Ancestry, Batley, Bridlington, Dewsbury, History and tagged Ancestry, Batley, Bridlington, Dewsbury, History. Bookmark the permalink. Lottie was my Grandfathers sister , thank you so much for this blog ! My grandmother never went to bed after this incident and would sit up all night waiting for news with a candle in the window . Please could you tell me where this headstone is in Batley. Thank you for the reply. I’m really pleased that those connected to Lottie have seen this blog. 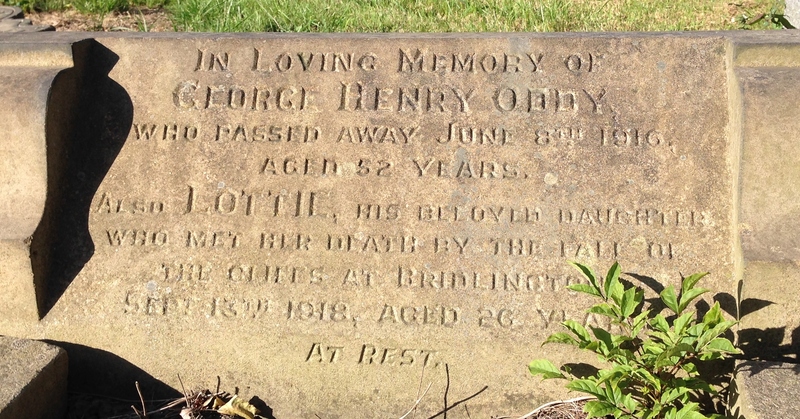 The headstone is in Batley cemetery immediately opposite the Arncliffe Road entrance.